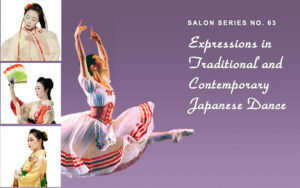 The Salon Series is an ongoing program of performances, informative and educational lectures, and lecture-demonstrations aimed at those who are interested in deepening their knowledge of the performing arts of Japan. The series is held on Sunday afternoons three times a year. For the past 19 years, with world class guest artists and speakers, the program has educated and inspired New York audiences artistically and intellectually. The series is held at Tenri Cultural Institute (43A West 13th Street, NYC). Tickets are available through Sachiyo Ito & Company. Refreshments are served during Q/A period. I feel blessed for my chance to attend Ito sensei’s classes and Salon Series. 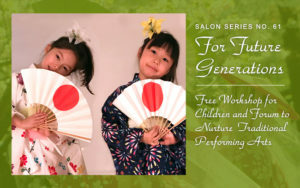 For the 20th Year Season, our theme of *Salon Series* is looking to future generations of traditional performing arts. This program will include dances performed by Dancejapan, the ensemble of Sachiyo Ito and Company, followed by the workshop. Children between 5-10 years old are all welcome. Have fun expressing beauty of flowers with a dance fan! The theme for the 20th year of Salon Series in 2018 is Traditional Performing Arts for Future Generation. In Salon Series No. 62, we will explore the question of why Japanese traditional arts continue to be honored and incorporated by contemporary artists. Japanese traditional arts have shown their influence on Western arts since the turn of the 20th century, beginning with Japan’s move to open its doors to the West in the 19th century. 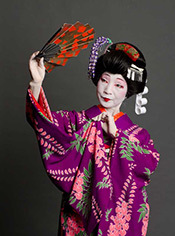 In this program, we will focus on Japanese influence on Western dance and theater. Our guest artists for this program are Yoko Shioya, Artistic Director at Japan Society, and Annie-B Parson, Artistic Director of Big Dance Theater, an award-winning contemporary theater and dance company. Yoko Shioya will open with a general overview and commentary on the current and future impacts of Japanese traditional arts on contemporary creative works. 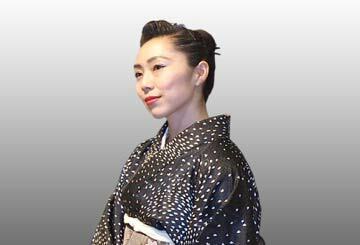 Sachiyo Ito will then follow with a demonstration on traditional Noh, Kabuki, and Okinawan dance and theater techniques. The demonstration will then conclude with a dance performance of an Okinawan court dance, Yotsudake Odori, and a newly created work inspired by Okinawan tradition, performed by members of Sachiyo Ito’s Dancejapan ensemble. 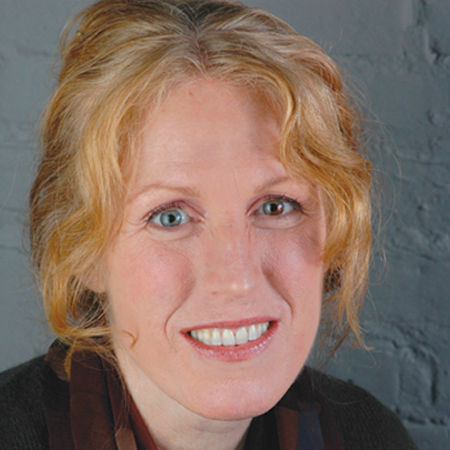 After the performance, Annie-B Parson will present a video excerpt of Big Dance Theater’s work entitled "The Other Here" that incorporated Yotsudake Odori. This work, which was commissioned by and premiered at Japan Society in 2007, is based on stories of well-known contemporary Japanese novelist Ibuse Masuji, whom Ms. Shioya recommended to Big Dance Theater as a source of inspiration. Ms. Parson and Ms. Shioya will then discuss the importance of collaboration and offer their insights on the contemporary creative process as inspired and supported by centuries-old Japanese traditions. After the discussion, we will open the floor to questions. The Salon Series No.63 will explore the great possibilities of contemporary expressions and creations based on centuries-old Japanese traditions. 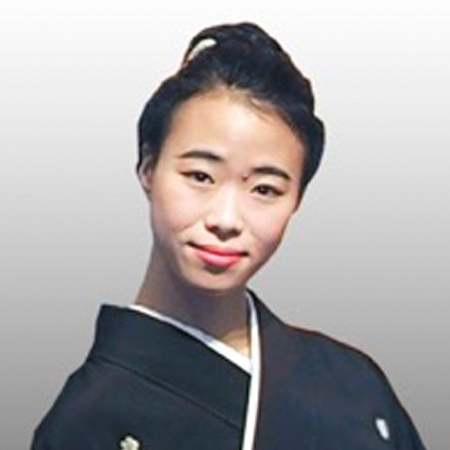 Shoko Tamai, Artistic Director of Ninja Ballet is invited as a guest artist. Sharing the theme of sky and water, the program will present a Japanese classical dance by Dancejapan ensemble, Seiten no Tsuru (Cranes in the Blue Sky), and the original work by Sachiyo Ito, Umie (To the Sea), while Ms. Tamai will present a repertory from classical ballet and her own creation. The program will conclude with an improvisation on the theme accompanied by vocalist Beth Griffith and Percussionist Yukio Tsuji. The theme for the 20th year of Salon Series in 2018 is Traditional Performing Arts for Future Generations. Thank you for your support to the Salon Series for the last 19 years. 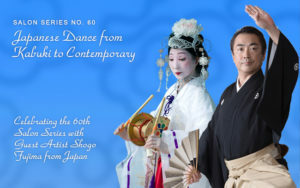 We are very grateful that we can celebrate 60th Series with special guests from Japan and New York, and with our Dancejapan members on June 18. I hope you can join us in this special occasion! Sachiyo Ito and Company will celebrate its 60th Salon Series of its 19th season with an exquisitely elegant and vibrant program featuring live music, the Dancejapan ensemble, and guest artists from Japan and New York. 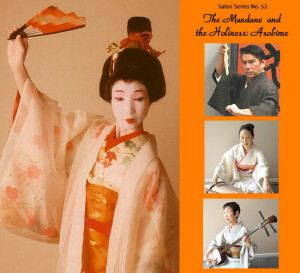 The Salon Series is a series of performances with informative educational lectures and lecture-demonstrations on the performing arts of Japan. They are held on Sunday afternoons three times a year. A dialogue between artists and audience following each program provides further insights into art and culture, bridging the cultural differences. With world class guest artists and speakers, the program has artistically and intellectually educated and inspired NY audiences. Supported by Consulate General of Japan in New York, our Celebration Concert will mark the milestone of the 60th presentation for the communities of New York and the tri-state area. Shogo Fujima, a Kabuki dancer from Japan is invited to join as a guest artist in this special occasion. The program will show a diversity of Japanese performing arts with music and dance from ancient to contemporary. 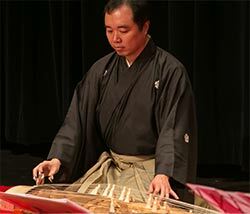 The concert program will begin with an ancient ceremony of purification and blessing with Etenraku, the Gagaku music. Following this are three Kabuki dances. First, Mr. Fujima, our guest artist from Japan, will be joined by Ito for Matsu no Hagoromo (The Angel’s Robe at the Pine Tree) from the 19th century Kabuki repertoire, based on the Noh play Hagoromo (Angel’s Robe). Following is the Kabuki dance, titled Seiten no Tsuru (Cranes in the Blue Sky). Then, Mr. Fujima will perform a Kabuki solo, excerpted from Masakado. The next work is titled Soshun (Early Spring), created by Ito for 7 dancers in the classical style. 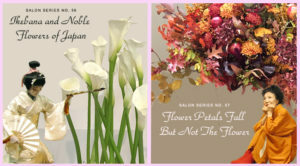 Also for this event, we have revived one of the most popular pieces from last year’s Salon Series, Flower Petals Fall, but not the Flowers, a collaboration with a contemporary florist. The final work, Only Breath, is from our Poetry in Motion Concert. It celebrates humanism in the arts and the “oneness” of people across the boundaries of culture and ethnicity, with dancers representing multiple dance cultures from around the world. The live accompaniment will include cello, biwa, shou, hichiriki, shakuhachi, electronic/synchronized music, percussions, voice and poetry recitation. The program was made possible, in part, by the public funding from Lower Manhattan Cultural Council, the New York City Department of Cultural Affairs in partnership with the City Council, the Japan Foundation New York, and by Japan Airlines. Roberto Lara, the guest artist, and Sachiyo Ito will discuss the transformation of genders in ballet and Japanese classical dance. 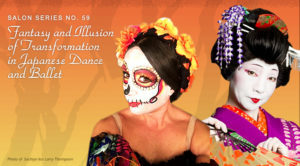 Lara, formerly of Ballet Trockadero, will perform an excerpt from his work La Catrina based on Mirtha from the ballet Giselle and the traditional Mexican myth of La Catrina, Queen of the Dead. 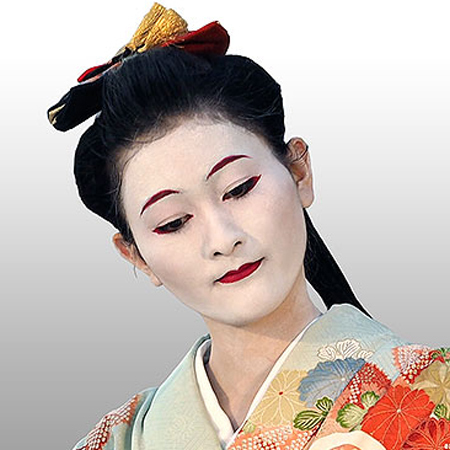 Sachiyo Ito will perform and demonstrate the transformation of female to male roles and vice versa as illustrated in the Kabuki dance, Azuma Hakkei, and will perform an excerpt from Fuji Musume (Wistaria Maiden), the most representative Kabuki Dance. Salon Series No. 58 on March 12 will investigate the role of Itinerant performers in Japan and Russia, and their surprising connections. Russian Gypsy female soloists paved the way for Anna Pavlova’s acceptance and success, while Anna Pavlova influenced the new dance movement in 1920s in Japan. Take a look into the culture of spicy and soulful Gypsy entertainment and how it had positioned a solo female performer in Russia in comparison to an accepted role of a woman in traditional society and on stage. Discover Ayako-mai, which was discovered in 1950-60s as a gem by folklore scholars, unknown among them for 300 hundred years. This dance style is freer and rustic than Kabuki dance, supposedly performed by the women itinerant groups, such as Okuni’s, who is considered as the founder of Kabuki in the early 17th century. 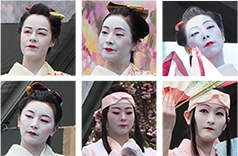 Get to know female itinerant performers who had established the foundation of Kabuki even though women does not take part in Kabuki. Experience the story of Anna Pavlova in Japan as a beautiful example of true art, which crosses borders, and challenges stereotypes. 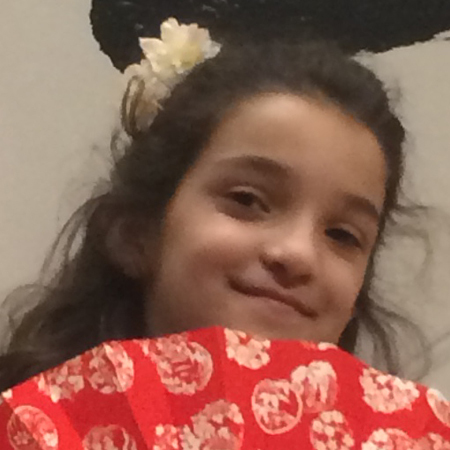 Ms. Kulakova will perform a Russian Gypsy dance while Sachiyo Ito and Company will present itinerant performers’ dance of the pre-Kabuki period. Also, Ms. Kulakova and Ms. Ito will perform their contemporary creations, evolved from and inspired by each tradition. This program is supported, in part, by public funds from New York City Department of Culture Affairs in partnership with the City Council. A collaboration inspired by contemporary flower arrangement by Katsuya Nishimori with live music. We will present the contemporary florist Katsuya Nishimori and his team, who will install an epic-sized creative floral arrangement on stage. Sachiyo Ito will decompose the arrangement inspired by the theme “Flower petals fall, but flowers do not.” The dance will be an improvisation as she faces and clashes with the beauty of the flowers- the form, and fights to retain the beauty of the flowers without form, which echoes after momentary existence. From destruction to final re-integration of art and identity, the dance will be accompanied by live music and singinging. Shikunshi, Aki no Irokusa, and Shiki no Hana. Ikebana is internationally known as the Japanese form of flower arrangement with a long history dating back to the 14th-15th century. 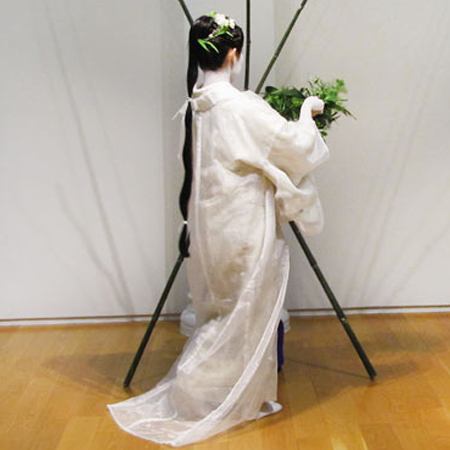 For this program Ryusei-ha School Ｍaster Masako Gibeault will demonstrate the art, and discuss the aesthetics of Ikebana. Also to be presented, a kabuki dance, Shikunshi (the Four Noble Flowers) along with two works, Aki no Irokusa (Various Flowers in the Autumn), Shiki no Hana (Flowers in Four Seasons), choreographed by Sachiyo Ito. The program will conclude with a discussion on aesthetics of Japanese classical dance, as it relates to the theory of the “flower” in Kadensho written by Zeami (c. 1363 – c. 1443). Admission: $15 general, $10 senior & student. With music and dance, we will first perform a cleansing and purification rite, creating sacred space as in ancient Japan,and then, we will culminate our ritual by inviting the audience to join us as we walk on a labyrinth path in a meditative walk led by Ms. Jean Ando. Come along, and join us in the sacred journey! 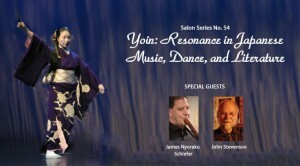 Inspired by Salon Series’ 2014 theme, “Ma” (special concept of time and space in Japanese culture), the idea of “Yoin,” (resonance) and its importance in Japanese performing arts and literature will be investigated through music, dance and poetry. John Stevenson will discuss the resonance in haiku and its influence on western poetry, while James Nyoraku Schlefer will talk about resonance in Japanese music. 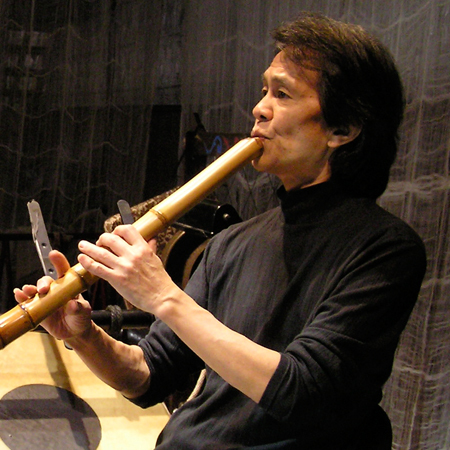 Schlefer will play his shakuhachi music, to which Sachiyo Ito will dance. The program will be concluded by an improvisational dance and music by Ito and Schlefer on a haiku composed by Stevenson. 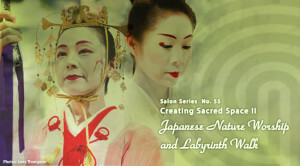 Salon Series No.53 explores major two genres in Japanese legends, Yamanba and Hataori Monogatari, through discussion, and presentation of two dances. 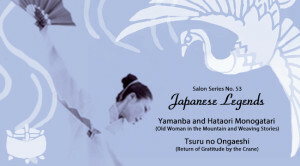 Yamanba (Old Woman in the Mountain), a Kabuki dance in Tokiwazu music, and the Weaving Crane, inspired by the folk tale Tsuru no Ongaeshi (Return of the Gratitude by the Crane) choreographed by Sachiyo Ito will be performed. Japanese legends abound in Yamanba stories, which inspired plays and dances in Noh and Kabuki such as Yamanba, Adachigahara also called Kurozuka, where heroines are portrayed as Oni-baba (Demon Old woman). The theme of “Kinshitsu” (Do not look into my room, or Forbidden Room) in Yamanba stories is shared by Tsuru no Ongaeshi, one of the most well-known folk tales. Tsuru no Ongaeshi is a part of the genre, Hataori (Weaving), which are widely spread Japanese legends, many of them are known as “Hataori-buchi” (Weaving abyss) or “Hataori-hime”(Weaving Princess). 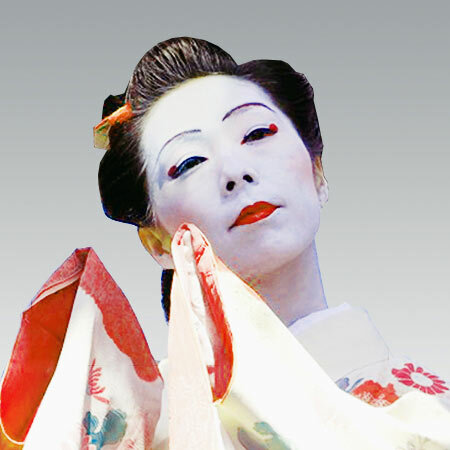 Through the performances of the Kabuki Dance Shigure Saigyo and the classical Sankyoku music, Kajimakura, Salon Series No. 52 will explore the life of Asobime (Play Girl) and Shirabyoshi (Shrabyoshi Dancer). They are the medieval entertainers, described as the profane, and yet who served a sacred role in Japanese history. Originally a Noh play adapted to a Kabuki dance, Shigure Saigyo, surrounds an episode about a poet /monk Saigyo and a courtesan/Boddhisattva, while Kajimakura is about the impermanence of entertainers’ lives. The Salon Series No. 51 will explore expressions of love through dance in the east and west, specifically, in Japan and Spain, based on the premise that dance is a mirror of culture. The program will present classical dances of each country, as well as contemporary dances in traditional styles, followed by a joint improvisation. An excerpt from Kyoganoko Musume Dojoji will be performed by Sachiyo Ito and accompanied by Sumie Kaneko. Last Sunday’s Salon was remarkably beautiful—the dance, the music, the chanting, the candles and the calligraphy. I can just imagine how much work and experience precede an afternoon like that. The Salon “Ma” was incredible. The visual, sound and poetry elements connected by your movements made the meditation of space and time profoundly meaningful. – Dalienne M.
The guest artist and Sachiyo Ito presented a co-demonstration on gestures, and abstraction and stylization of gestures in acting and dancing, followed by performances from Kun Opera and Kabuki dance. The highlight of the program was the collaboration on a Chinese poem sung as a Chinese opera, in Japanese melody, and choreographed/danced by Sachiyo Ito as a new Japanese dance. The program examined similarities and differences between Okinawan dance and Indonesian dance through demonstration of dance movements. Ms. Suryani and Sachiyo Ito gave a co-demonstration on the basics of dance forms focusing on hand gestures. Several Okinawan and Indonesian dances were performed to illustrate the demonstration. The Japanese are known to be less verbal. 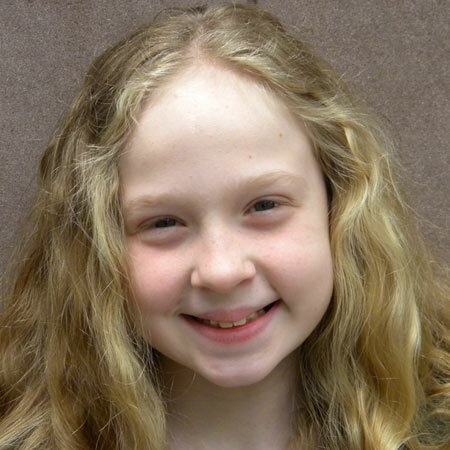 The program examined why and how we use them in daily life and if any of those are reflected in dance. The mime artist and Sachiyo Ito gave demonstrations to illustrate how a mime draws gestures from daily life as a comparison. To gain further insight, excerpts from Kabuki dances, Haru no Umi choreographed by Ito as well as the guest’s Fisherman were performed. The program encompassed various dance disciplines from Japanese classical dance and Okinawan dance to ballet, and contemporary dance to exhibit the walk, the very basic of dance techniques. The co-demonstration of walking techniques was followed by a dace work from each artist. The cultural and social meanings that affect the dance forms were discussed. For the first time in 14 years of Salon Series, the program was presented as a workshop. Participants chose to learn Walking meditation or, Shakuhachi meditation, or both. 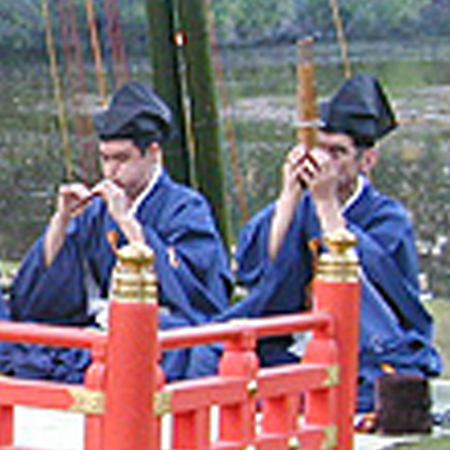 The Japanese bamboo flute, the shakuhachi, is associated with Zen Buddhism from 16th century Japan. Playing Honkyoku pieces is referred as Sui-zen (blowing Zen), and focuses on breath and concentration with the mind of Za-zen (sitting Zen meditation). The Shakuhachi master taught how to breathe in to flute, while Sachiyo Ito led a walking meditation in the tradition of Community of Mindfulness. A dance created as a dedication to Japan’s Earthquake victims concluded the program. Seiza, the Japanese way of sitting on the knees, was explained as it exists in life and the arts. An excerpt from a typical Japanese classical dance, Kagamijishi, was followed by a discussion on how the Japanese sit and also in the arts such as tea ceremony with a brief demonstration of tea ceremony, and how it is used in dance. The physical therapist explained about the functions of knees and muscles and issues in Japanese-style sitting. The influence of Japanese Theater on Western Theater and Literature was discusses, followed by performances of Hagoromo (Shimai, Noh dance), and the new work titled, At the Still Point of the Turning World inspired by Four Quartets By T.S. 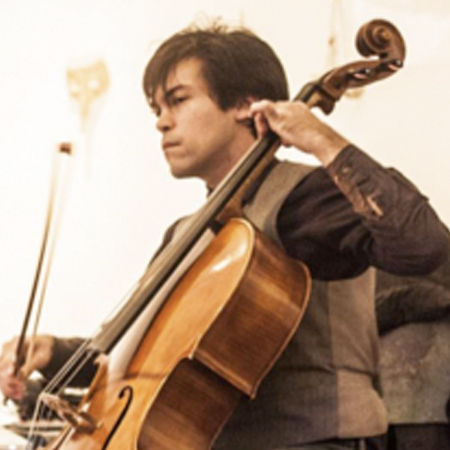 Eliot with cello and vocal. 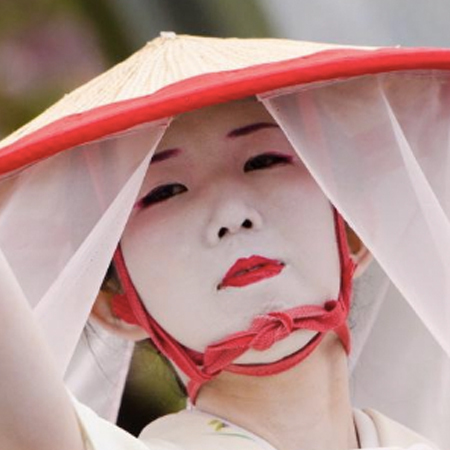 Butoh, the world-renowned contemporary dance originated in Japan in 1960s. The Butoh artist demonstrated the techniques, talked about her philosophy, and performed her work, Ritual. To guide an insight as to how their techniques and philosophy are derived from the tradition and cultural roots of Japan, Sachiyo Ito joined in the demonstration, and presented a dance inspired by her dance. Okinawan folk music and dance with audience participation in Kachashi, the uniquely Okinawan improvisation dance, was presented. 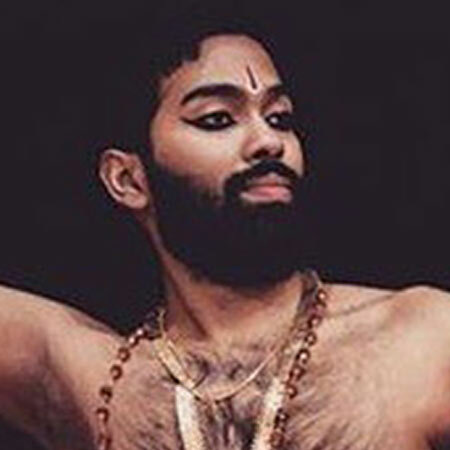 Inspired by “Improvisation on Rokudan,” with Indian instruments based on Japanese melody, the dancers and musicians trained in the classical traditions of Japanese and Indian music collaborated to create contemporary works. The program presented the demonstation and performance of Fue and Shakuhachi with dances choreographed to their contemporary pieces. The rare arrangement of Haru no Umi, from koto to violin and flute was also performed. The program explored breath work, stance, posture alignment, use of energy called “Chi” (Ki), the idea of Ying/Yang, and centering and balancing of body mind from the view of point of one of the Asian healing arts practitioner and that of a dancer. Okinawan dance was performed to illustrate the above. 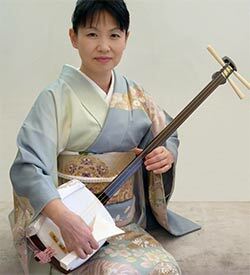 Sanshin, the Okinawan three stringed instrument, was first introduced form China in the 14th century, then transformed to shamisen on mainland Japan. Sanshin and Shamisen players talked about the instruments and their music traditions, and demonstrated how they are played. Okinawan dances accompanied by Sanshin and Jiuta-mai dances by Shamisen were performed. Tenri Gagaku Music Society of New York has handed down the music tradition of the Japanese court here in New York. Following priestess dances accompanied by Gagaku, the Gagaku instruments, the close relationship of music, dance, and religion were discussed. This topic was well received at Salon Series No.23 in 2005, and audiences have continued to ask for a repeat. 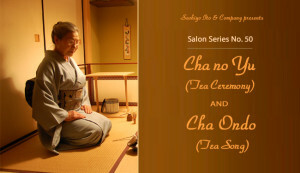 To meet this popular demand, Salon Series No. 32 presented Renku and Dance again. Following rules for Renku (linked verses) established in the 16th century, haiku and dance were linked and alternated as one inspired the other in improvised performance. Members of the Haiku Society of America joined in the program. The live music accompanied the dance was improvised by three musicians. In contrast to Salon Series No. 30, this program explored modern poetry in the 20th century. Selections from “Chieko-sho,” written by the modern Japanese poet Kotaro Takamura in 1940s, were read and a dance choreographed to Chieko-sho were performed to demonstrate a contemporary example of the fusion of dance and poetry. 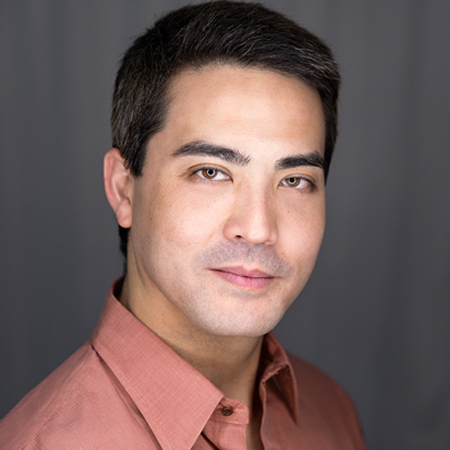 Guest Speaker: Lewis Cook, Ph.D.
Waka, the court poetry of the 11-13th century Japan, served as the central vehicle for many of the Noh plays produced in the 14th century. Prof. Cook gave a brief survey of waka, and discussed “Eguchi,” one example of Noh based on waka poems and episodes about the legendary waka poet Saigyo. Also, a Kabuki dance, entitled “Shigure Saigyo” (Saigyo in the Autumn Rain) was performed. The program examined the relationship between Okinawan dance, particularly the male dance, called Otoko Odori, and martial arts, with Karate. Meh-nu-hama, and Takadera Manzai, from Otoko Odori repertory of Okinawan dance were performed. Salon Series No. 28 presented Gagaku, the Japanese court music, with a talk on the history and tradition of Gagaku by members of Tenri Gagaku Society. Also a choreographed work by Sachiyo Ito as a contemporary interpretation was presented. Ms. Wu and Sachiyo Ito presented a comparative demonstration on traditions and techniques of dance and theater forms of Japan and China. Members of the Kunqu Society gave a performance as well as Ms. Wu. Featuring contemporary music and dances in the 20th through 21st century, and to the current popular music, contemporary dances such as Nanyo Hamachidori, and Warabi-gami were presented accompanied live. 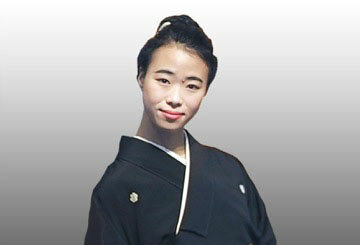 Guest Artists: Sue Yen Park, Director of Korean Traditional Performing Arts Association. Dance performance and video showing on the Korean shaman’s ritual and Okinawan religious ceremony were resented together with comparative demonstration of the dance forms. The program explored the arts and the social roles of geisha, courtesans, and priestesses, and their relationship with Fugen Bosatsu, one of the Bodhisattvas, who helps sentient beings toward enlightment. Dances in the program included: Kurokami, Kishi no Yanagi, and an excerpt from Shigure Saigyo. Guest Artists: Four poets from the Haiku Society of America, Terry Ann Carter, Penny Harter, William Higginson, and John Stevenson; Musicians: Yumi Kurosawa, James Schlefer, Yukio Tsuji. Following rules of Renku (linked verses) established in the 16th century, haiku and dance are linked and alternated, as one inspires the other, and composed as an improvisation. Art as an Expression of Ethnic Identity: A Case of Okinawan Court Drama. Sachiyo Ito discussed Okinawan court drama–how it was established and came to exemplify Okinawa’s pride in 18th century. The program also featured music and dances from current popular repertory showing that the tradition is alive in New York today. 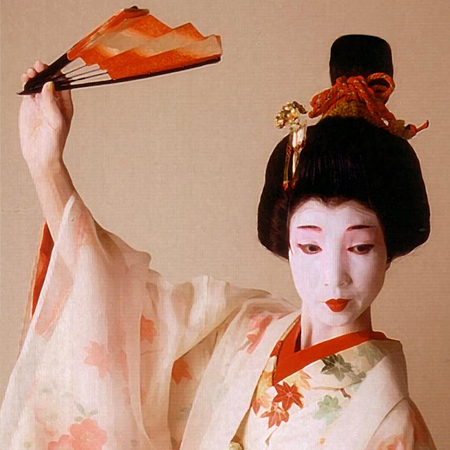 The techniques of female impersonation in the kabuki theater, and the transformation from female to male, and vice versa in the Japanese classical dance, and the social and cultural background that nurtured the Edo Kabuki was discussed and demonstrated. 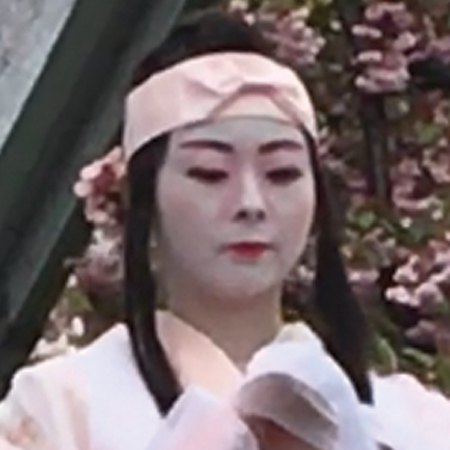 A kabuki dance, Hokushu, was performed as an illustration of her talk. Rajika Puri and Sachiyo Ito demonstrated comparison of the traditional dance forms and departure works choreographed by each. The dancers performed together at the end honoring each culture. Okinawan Court Dance and Music were presented together in their newly adopted versions. The program addressed the issue of aesthetics of insanity in the Greek drama and Japanese theater, and discussed its underlying meaning of insanity in the two theater traditions. An excerpt from a Kabuki dance drama, Onatsu Kyoran (Onatsu, the Insane) was performed to illustrate the above. 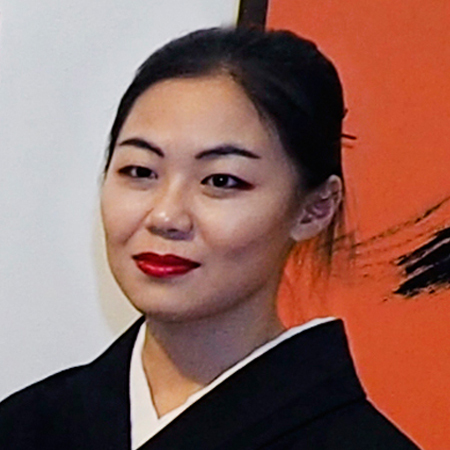 Sachiyo Ito gave a demonstration on technique and stylistic differences between female and male roles in Kabuki dance. Sachiyo Ito and Company performed excerpts from Azuma Hakkei, Hokushu, and Danjuro Musume. Demonstration on Sanshin (Okinawan 3-stringed instrument) was presented, and musicians played several pieces from court music and folk music as they accompanied the dances. A program of improvisation of dance inspired by Haiku, which were composed by audience was presented. Mr. Schelfer, the Shakuhachi Grand Master of Kinko School, gave a talk on the issue of egoless ness in performance, and played Shakuhachi. Sachiyo Ito danced to his music, “Night Pond” (Composed by Jeffery Lepondorf, choreographed by Sachiyo Ito). 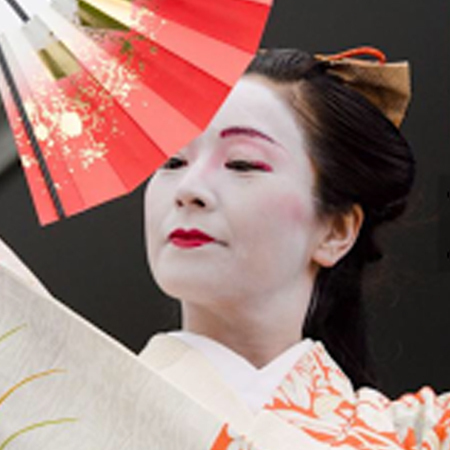 Exploring the themes in Japanese classical dance—from love stories in Kabuki plays, puppet plays to symbolism in the nature, as expressed in the Japanese poetry several kabuki dances were performed. 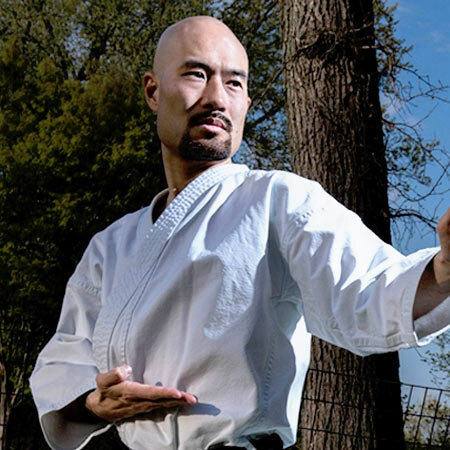 The program explored if there are similarities in the movement patterns and basic techniques such as use of breath between Karate, the martial art, and Okinawan Dance. 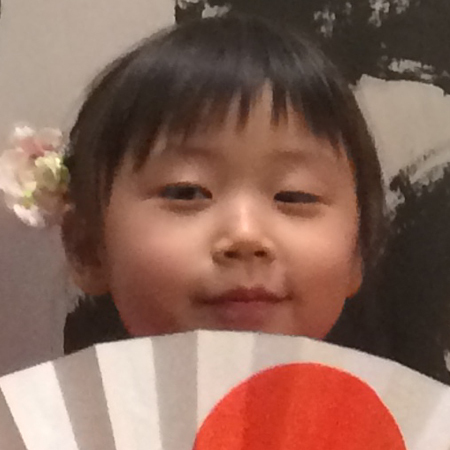 The program examined if there were differences in the movement patterns and basic techniques among schools of Japanese classical dance. Dance demonstrations will include experts from Echigojishi, Asazumabune (kabuki dances) performed in the styles of Hanayagi, Fujima, and Tachibana Schools. Indonesian dance, Kabuki dance and Okinawan dance were demonstrated by Deena Burton and Sachiyo Ito, and they explored predominant themes in their dance forms. Professor Lieter discussed the theme of transformation in Kabuki plays focusing on the Dojoji genre. Sachiyo Ito performed excerpts from Kyoganoko Musume Dojoji (Kabuki dance), based on a legend surrounding the Dojoji Temple to illustrate his talk. Eido Shimano Roshi, Abbot, Dai Bosatsu Zendo Kondo-ji and Shobo-ji, discussed the Buddhist morality tale, the Dojoji legend surrounding the bell of Dojoji Temple. Sachiyo Ito discussed Okinawan version of the story and performed excerpts to illustrate their talks. Sachiyo Ito demonstrated techniques of hand movements and gestures of Okinawan dance as she compared those of Kabuki dance. Hamachidori, Nanyo Hamachidori, excerpts from Kyoganoko Musume Dojoji were by performed as illustrations. Sachiyo Ito, Ph.D. discussed styles and movements of Okinawan dance. 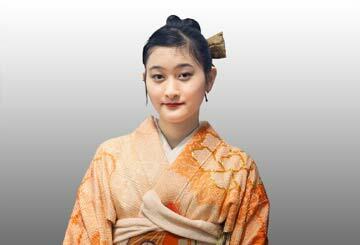 She examined differences and similarities with those of Noh, Kabuki, and Jiuta-mai. Dance demonstration included Kashikaki, Hamachidori, and Me nu Hama. 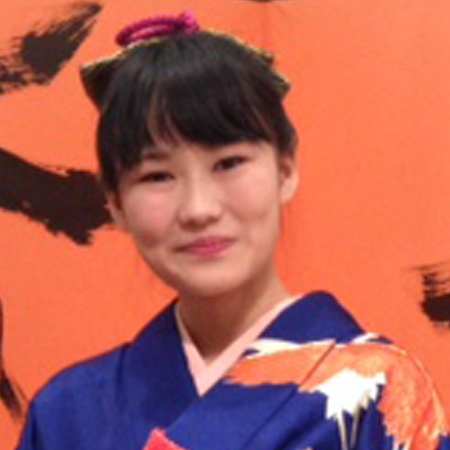 Sachiyo Ito demonstrated techniques of jumping and stamping in Kabuki dance, and demonstrated sections from Tomoyakko and Tamatori Ama. 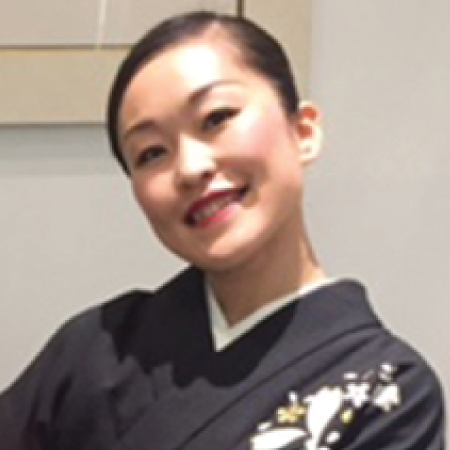 Sachiyo Ito, Ph.D. discussed the techniques and styles of Jiuta-mai, one of the Japanese classical dance forms. 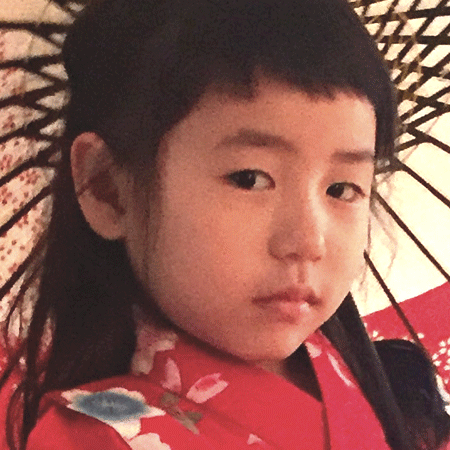 Jiuta-mai is gaining a new recognition among various forms of Japanese dance. The demonstration focused on differences and similarities with Kabuki dance and Okinawan court dance, and Kurokami was performed. Representing various genres of Japanese dance, Mai, Odori and Buyo , Hagoromo from Noh, Nishimonai Bon Odori from folkloric dances, and Fuji Ondo and Koma from Kabuki dance repertory were performed. Examining the close relationship between Matsuri (festivals) and the performing arts with a slide lecture by Sachiyo Ito, Ph.D., gave a talk and performed Sambaso, the Kabuki dance, and Kajade-fu, the Okinawan dance.